The state of Jammu and Kashmir is placed under Governor's Rule after resignation of Chief Minister Mehbooba Mufti. In other states, President's Rule is imposed after collapse of the local government under Article 356 of the Constitution. But Jammu and Kashmir has its own separate Constitution that provides for an intermediary statutory layer in the state. Provided that nothing in this section shall authorise the *Governor to assume to himself any of the powers vested in or exercisable by the High Court or to suspend in whole or in part the operation of any provision of this Constitution relating to the High Court. (2) Any such Proclamation may be revoked or varied by a subsequent Proclamation. (3) Any such Proclamation whether varied under subsection (2) or not, shall except where it is a Proclamation revoking a previous Proclamation, cease to operate on the expiration of six months from the date on which it was first issued. (5) No Proclamation under this section shall, except where it is a Proclamation revoking a previous Proclamation, be laid before each House of the Legislature as soon as it is convened. 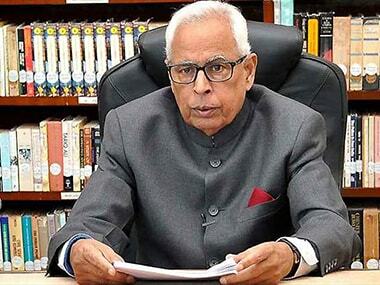 As per Article 92 of the Jammu and Kashmir Constitution, Governor's Rule is imposed in the state for a period of six months. Jammu and Kashmir assembly remains under suspended animation during this period. However, the governor may dissolve the assembly. Suspended animation of the assembly means the elected MLAs remain in office and legislative assembly continues to exist without the power of legislation. The governor assumes the power of legislation during this period. At the expiry of six months of Governor's Rule and if suspension of assembly has not been revoked, Jammu and Kashmir comes under the President's Rule as mandated by the Constitution of India as per Article 356. However, in both the cases, the governor administers as per the Centre's directions. If the Governor decides to dissolve Legislative Assembly during his own rule or when the state is under the President's Rule, election shall be held within six months. If the Election Commission does not hold polls in Jammu and Kashmir within six months from the date of dissolution of Assembly, it is required to explain reasons for not doing so. The security situation has been a concern in Jammu and Kashmir for delay and deferment of assembly elections in the past.